Patio grilling was revolutionized with the invention of the electric grill. With the Char-Broil TRU Infrared Bistro grill (model 16601578), a compact version of an electric grill is provided, making it easy for you to grill your favorite foods. The Char-Broil TRU Infrared Patio Bistro grill features an updated version of the Patio Caddies design creating a stylish grill visually along with optimal cooking performance for your barbecuing needs. Compact in size, you can easily place the grill on a patio or deck to enjoy a cookout whenever you like. Infused with the Infrared technology, the grill has the look of a gas-style grill but the precision controls of an electric model making it easy for you to reach the temperatures you desire during cooking. The Patio Bistro by Char-Broil offers the features of a bigger sized grill in a compact setting. Because the grill is electric, it can be used a variety of settings from a condo or apartment balcony to smaller patios or decks. With the quality infrared cooking system, you are able to grill anything you like with even heating for the perfectly cooked meal. The grate for cooking reaches the same temperatures no matter where the food is placed so that you do not come across hot or cold spots when cooking. The 1750-watt electric burner has a precision temperature dial where you can have complete control over your cooking temperatures. The cooking surface of this electric grill is 240 square inches in size and is porcelain coated. On top of the main grilling surface, the Patio Bistro also offers a separate raised cooking surface that is 80 square inches in size. The total surface for grilling can easily handle 8 to 12 hamburgers, chicken breast, steak and more. Once your meal is done, you can easily clean the grill body and then store the grill out of the way until you barbecue again. The small design makes for quick cleanup and the unit can be stored out of the way easily. When this review was written, there were more than 1,330 customer reviews at Amazon on the Char-Broil TRU-Infrared Patio Bistro Electric Grill in red. The grill has 3.9 out of 5 stars and seems to be a favorite among consumers when it comes to electric barbecue grills. More than 55% of reviewers gave the grill a 5 star rating while around 19% gave the grill a 4 star rating. The lower ratings were much smaller percentages with only around 12% rating the grill 1 star. Individuals who had issues with the grill stated that heat would escape when the grill was opened which lowered the cooking temperature for a time. Some reported the grill stopped working after a few months or would not reach the desired temperature when cooking. 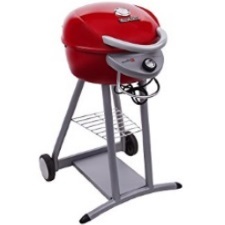 As far as consumers who loved the grill, reviews discussed how easy the grill was to assemble, clean and use. Such comments were made as … “a well-made product at a fair price”… “perfect. Met my high expectations”… and “a very nice grill worth the price”. Overall, the positive reviews outweigh the negative with consumers enjoying this grill for their barbequing needs. At around $200, the Char-Broil TRU-Infrared Patio Bistro Electric grill is a nice addition to any patio or deck area of the home. Overall reviews are positive in regards to the assembly, use, and cleanup of the grill. The grill is perfect if you plan on cooking for your family or a small group of friends. Keep in mind that the grill is smaller in size so it will only be able to cook so much at one time. This grill is better for smaller families or individuals who only cook for small groups. Consider the Char-Broil TRU Infrared electric grill when purchasing a new grill for your patio, deck or balcony area of an apartment or condo. With its smaller size, you will easily be able to use the grill and store it once you are done grilling. The quality features of this grill make for even cooking temperatures which equal evenly cooked meat with just the right amount of moisture, minus any drying out. Have fun grilling in the summer or even fall and winter months as this grill is electric and it is easier to maintain cooking temperatures.